Need to find great topics to blog about? Steve Scott has a Kindle Book that helps you through this topic without all the struggle. And for a limited time, that Kindle book is FREE! 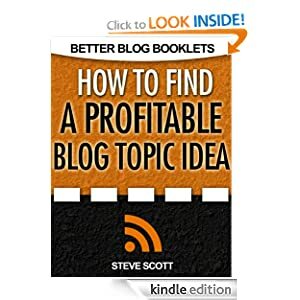 The title is How to Find a Profitable Blog Topic Idea (Better Blog Booklets) and it is part of a larger series on blogging from the same author. I wanted to let you know about it while it is still free, because I know that you can benefit from the things that Steve is covering. So head over to grab it before the price goes back up! Free Gifts That Save Kids’ Lives! because the cost was completely out of reach. Luckily, we know a great doctor. And now, you can help him do more. interviewer on the cable TV news channel asked him. "I will take good care of my mother," the boy replied. And his words had deep meaning. Much more than may be apparent at first glance. Vinodh. Until he became too ill to ignore. reach out with a helping hand, and save her little boy. has funded 70 more like his since then. and ambition is to take good care of his heroine – his mom? Oh, he said he also dreams of being a doctor. Thank you – for helping him dream! the room which resulted in surgery for one child in India. The students at NAMS saved a life. This one is truly different. But of course, we’d take a donation from you for Dr.
You name it, it’s there. Remember, this is open at 10 a.m. ET on Friday, Aug. 20th. Sign up now to get in first. Stay tuned, I’ll let you know as soon as this is released. share with you in a long time.